Welcome to Pho Saigon 808 – Authentic Vietnamese Food in Lahaina Maui Hawaii – Dine In or Take out! Catering & Delivery! Pho Saigon 808 brings you authentic Vietnamese food with so many dishes to choose from. Appetizers, Salads, Saigon Rolls, Authentic Vietnamese Soups, Saimin or Chow Fun Soup, Pho-Beef Noodle Soup, Vermicelli Noodles, Rice Plates, Fried Rice, Claypot Specialties, Entrees, Beverages & Desserts. 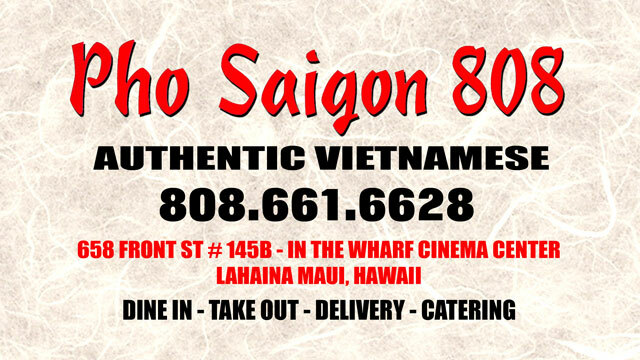 Pho Saigon 808 is open from 11am to 9pm daily, Pho Saigon 808 is an affordable way to get a great meal in Lahaina! Whether you’re looking for Lunch or Dinner, Vietnamese, Vegetarian or Seafood, Pho Saigon 808 has it!